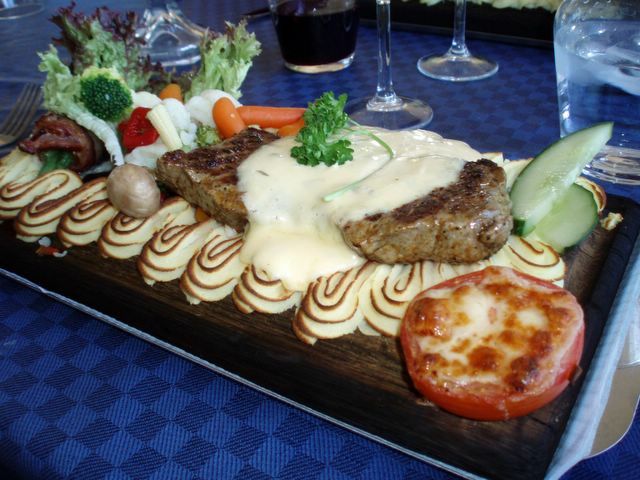 This is "plankstek" - literally "steak on a board". And that's essentially what it is! A steak. On a board. Surrounded by mashed potato, sauce (usually béarnaise), a grilled tomato, and often asparagus or haricot verts wrapped in bacon. This particular one had lots of other veggies too - some boiled, some fresh. The boards are made special, and some people buy the to make this favorite at home. You can find this as not-so-classy restaurants everywhere - it's dead popular. This one comes from Restaurang Jugen Jon, the closest restaurant to our cabin in Dalarna.